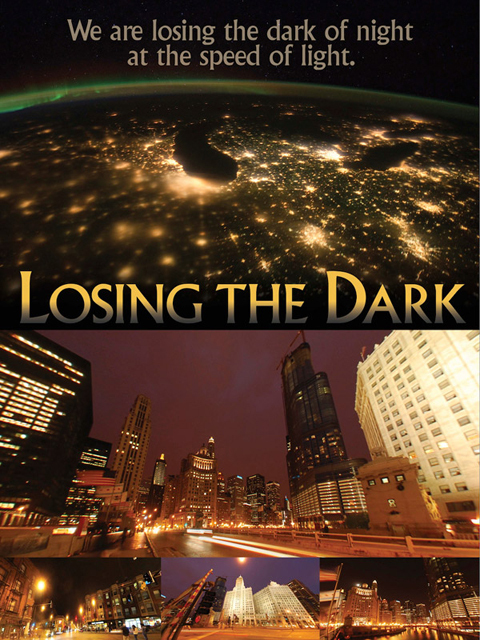 “Losing the Dark” – a short planetarium show and video on light pollution. Available as a FREE download in 15 different languages! Starry skies are a vanishing treasure because light pollution is washing away our view of the cosmos. It not only threatens astronomy but also disrupts wildlife, and affects human health. The glows over cities and towns — seen so clearly from space — are testament to the billions of dollars spent in wasted energy by lighting up the sky. The “Losing the Dark” planetarium show is the result of a collaboration between IDA and Loch Ness Productions. It introduces and illustrates some of the issues regarding light pollution and suggests three simple actions people can take to help mitigate it. The show gives planetarium professionals a tool to help educate the public about the problems of light pollution. Planetariums are uniquely positioned to teach audiences ways we can all work together to implement responsible use of lighting. “Losing the Dark” has no license fee. The show has been rendered in many formats and languages, and you can download it below. If downloading is not a viable option (for example, the movie files are too big for efficient downloading, or a theater requires frames to encode or slice its own movies), Loch Ness can ship the fulldome show on a USB drive. There is a minimal cost for this, outlined on the Prices/Ordering page. The show is also available directly from selected fulldome vendors whose systems use proprietary encoding. In addition to the fulldome version for digital planetarium use, we offer “Losing the Dark” as a conventional flat screen video. It’s available on YouTube in more than 15 different languages for online viewing, sharing and embedding on blogs and webpages. It can also be downloaded, for use in classrooms, kiosks, museum theaters and advocate multimedia presentations. Classic planetarium theaters without fulldome capability can show this version using their traditional video projectors. Loch Ness Productions and the International Dark-Sky Association are pleased and proud to make “Losing the Dark” available to planetarium theaters, educators and viewers around the world! If we all work together, we can bring back the dark of night to planet Earth. “Losing the Dark” is a joint production of the International Dark-Sky Association and Loch Ness Productions.